There hasn't been much to write home about in the last three years, and that will be Paul Tisdale key area of focus, his number two says. Suffering two relegations in three seasons sees the club in League 2 next season - the lowest they have been since 2008. Tisdale's arrival last week brings about their third managerial change in a little over 18 months, a stark contrast to the previous six-and-a-half years under Karl Robinson. Having now been at the club a little under a week, Matt Oakley, who left Exeter to join Tisdale as his assistant manager, has been getting his feet under the table at Stadium MK. 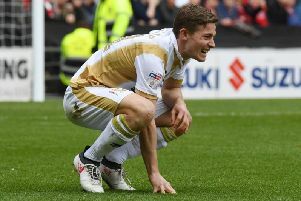 He has been tasked by Tisdale to work out what has been going wrong for Dons in the last few seasons but believes, primarily, it will be bad habits and a general losing mentality which will be the biggest factors in turning the club around in the first few weeks. He said: "We have to change losing habits, losing streaks. It will take time, it’s a building process. I wouldn’t expect wholesale changes, it will be a slow process but eventually we’ll get the squad in a place where they’re competitive, winning games and it breeds confidence. The fans see that, they get confident, understanding what we’re doing. Together we will move forward as a club. "We’re reviewing and finding out what happened in the last few years. We know they’ve had success here, but it has been a tough time for the fans and the people who work here. There has been a lot to do and a lot to take on in just a week. But this is the best time to take over because we’ve got the summer to look at things. If you come in mid-season, it’s even tougher. We have time to look at things, sort things out but also to see what is working well. "We’re really exciting about coming. It’s a different feel and project to Exeter and that will need addressing, but we’re impressed with the tools we have here, and it’s now down to getting the players doing the right things and winning games." The former Southampton, Leicester and Derby midfielder admitted the task of turning things around at the moment is much harder given how he has only met a handful of players and staff so far. And until the new managerial staff meet everyone, Oakley said there is only so much the new trio can do before the players return for pre-season training at the end of the month. "It’s very difficult for us (having not met them)," Oakley continued. "And I hope we will get to talk to the players as a group, individually and as units – defence, midfield and attack. From there, we will set out how we work, which will probably be completely different to how it was before. "Then we start pre-season, game time, getting minutes into your legs, recovery and details around that. But I’m looking forward to meeting new players and new people." With a new manager in place, fans are already desperate for news of signings. Oakley though said there are bigger issues at hand. He said: "There will be bad habits at this club, so that will be the first area to look at, and then dealing with recruitment, injuries, when the players will be back and so on. But right now the most important thing will be the recovery for the players. "Relegation: I’ve been there, I know what it feels like. It’s not a good place to be.There will be lads in the squad who will be looking at whether they’re moving on, also injuries. "Every agent you can imagine will be in contact with the club trying to put forward their players. We will look to improve on the squad, but there’s no reason why this club cannot be competitive this season."